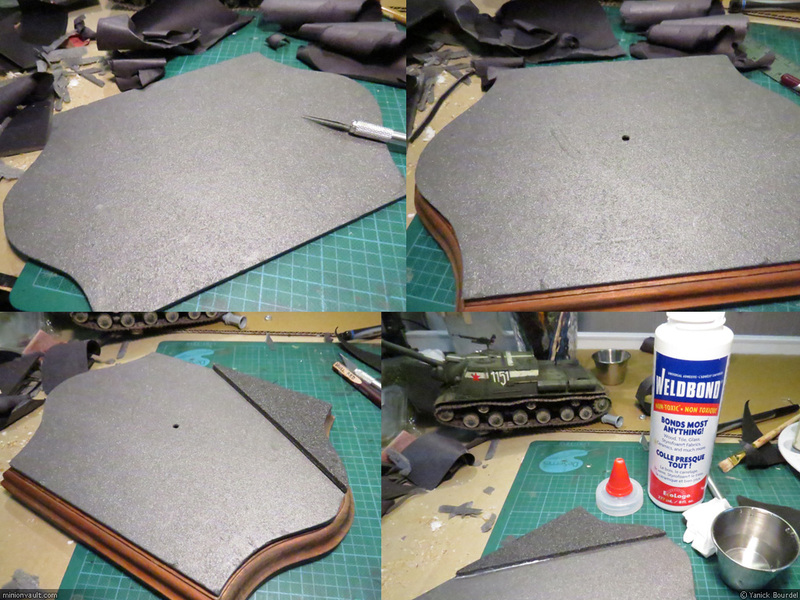 Sorry everyone: I didn’t take photos of the painting an weathering steps of my ISU-152 diorama. This is just the final result. The painting of the base began with a few dry-brushing of dark blue grey, up to a light brown-grey. I then used various pigments, with alcohol as a temporary fixer. 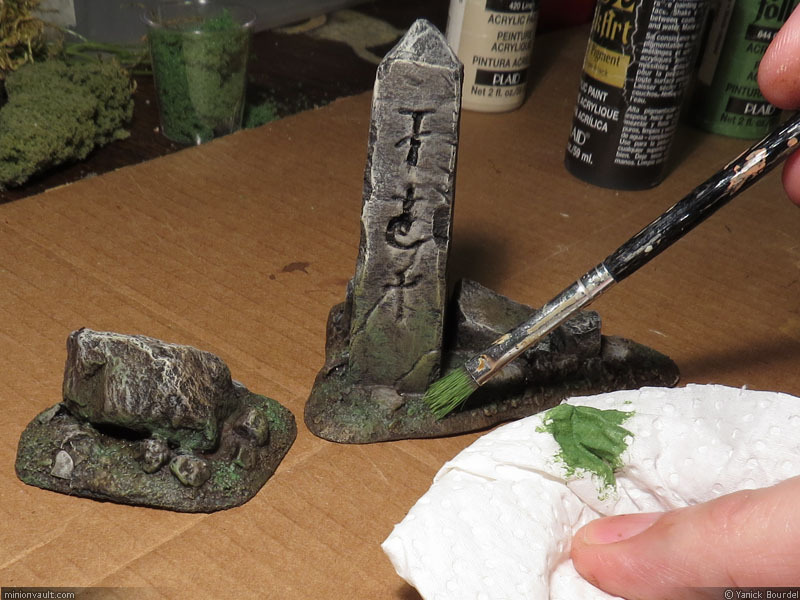 When I was satisfied with the pigments, I dabbed matt varnish onto the base using a soft brush. Once dry, I used the airbrush to slightly darken an lighten some areas. With various diluted shades of blue grey and greenish grey, I went over some individual rocks to break the monotony of the cobblestone pavement. I then dropped some twigs, hemp rope fibres and small rocks, to dirty up the road. The manhole cover, the drain grid and the tram rails were given a brown coat, followed by rust and pale dust pigments with a final metallic highlight (dry-bushing with gun-metal acrylic). For the newspapers, I searched the web to find real examples of WWII german newspapers and printed them to scale on my laser printer. I soaked them in diluted white glue and apply them to the base. When they were dry, I used an earth coloured wash to make them look dirty and old. I then spayed 3 generous coats of matt varnish on the whole diorama with the airbrush to seal everything and bind the pigments. The tramway post is from Mini-Art and the wires are scratch builded from thin metallic wire. The Nazi flag was made from Magic-sculpt and carefully painted. 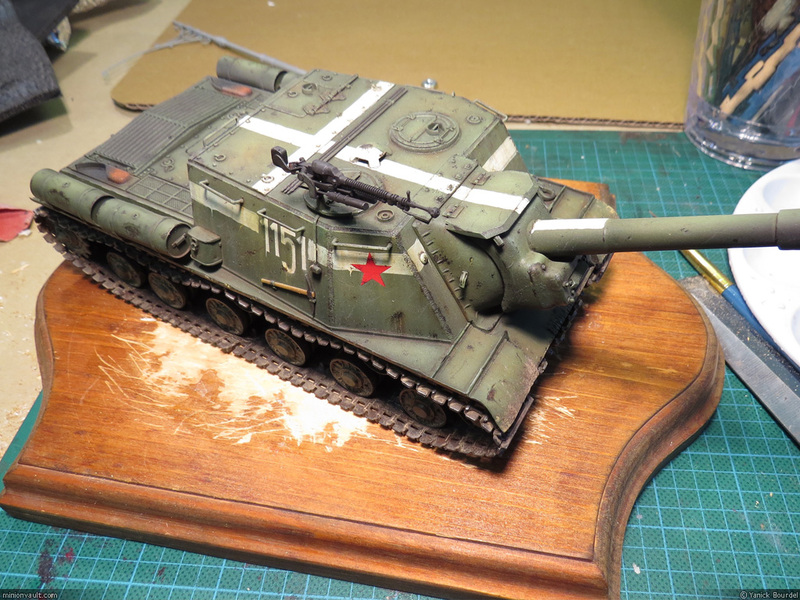 I think it adds a nice touch of color to the diorama and goes really well with the red star on the tank. Finally, I added tiny dead leaves (dried Oregano…) to the base and the tank. While waiting for my order of Krycell snow to arrive, I started to work on another diorama. This one, for my ISU-152. 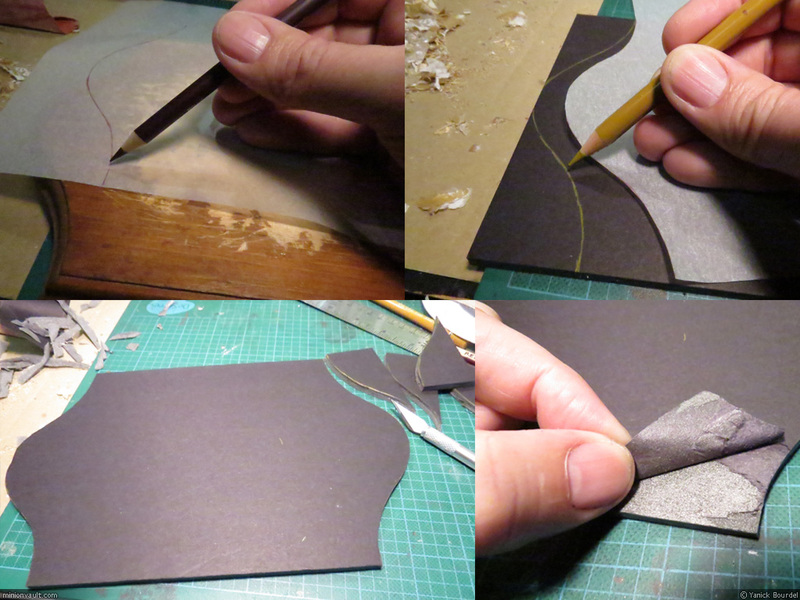 I decided to document pretty much every steps while doing it, so enjoy the step by step making of this diorama, part 1. 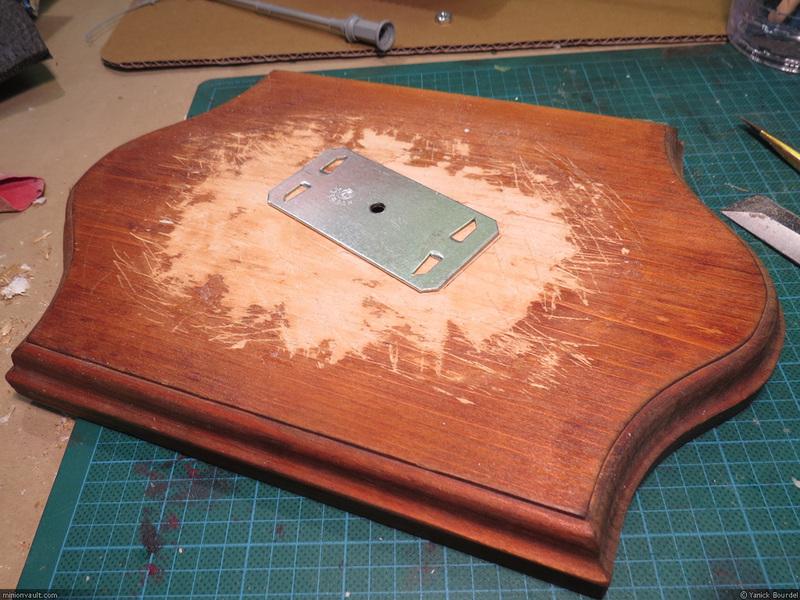 1- The base itself: A simple, and used, bevelled wooden base I had lying around would do the trick here. 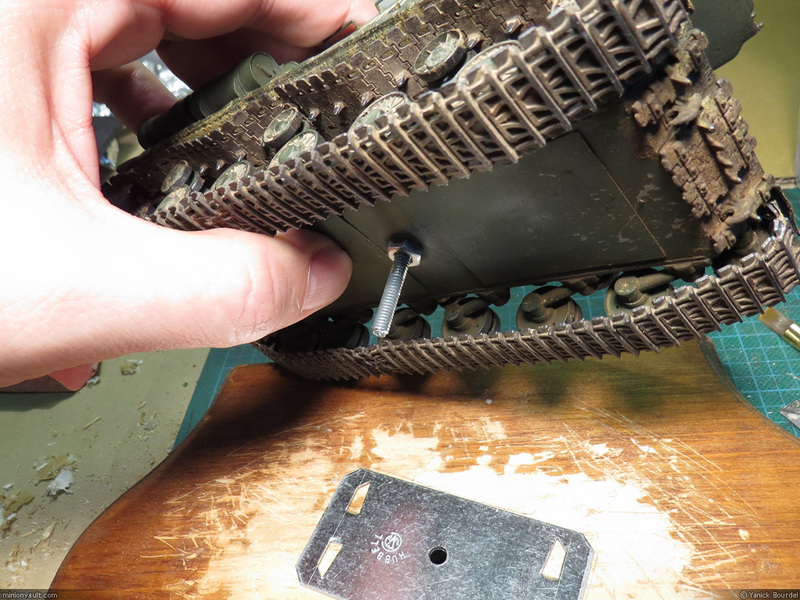 I had to scrape off some glue and old basing material from the surface with a chisel, then I used a hammer to fix a metal plate in the center, as a support for the bolt that will hold my tank in place. 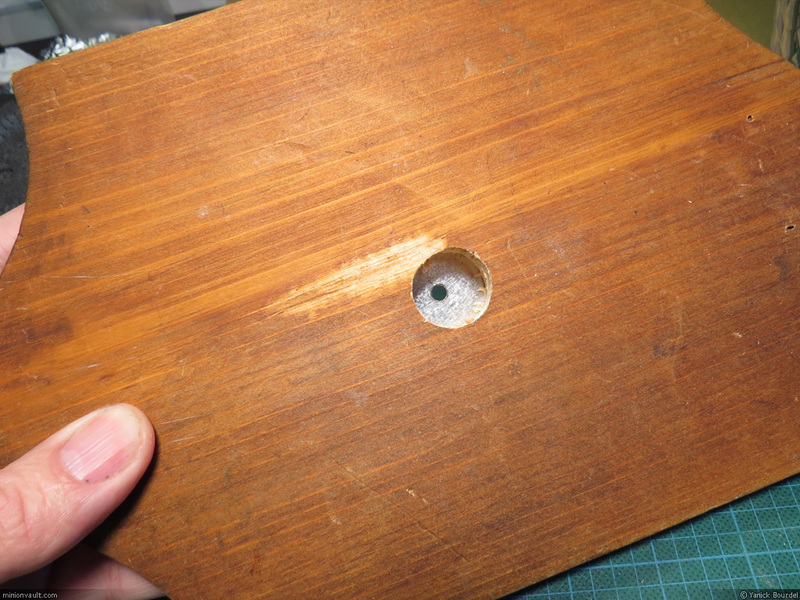 2- I made sure to drill a large hole in the base before, so it will be easy to turn the nut on the screw under the tank. 3- Foam core is a nice material to “carve” stone work. I used tracing paper to reproduce the exact shape of the wooden base, then used an X-Acto knife to cut it. I carefully peeled one side of the black cardboard from the foam core. 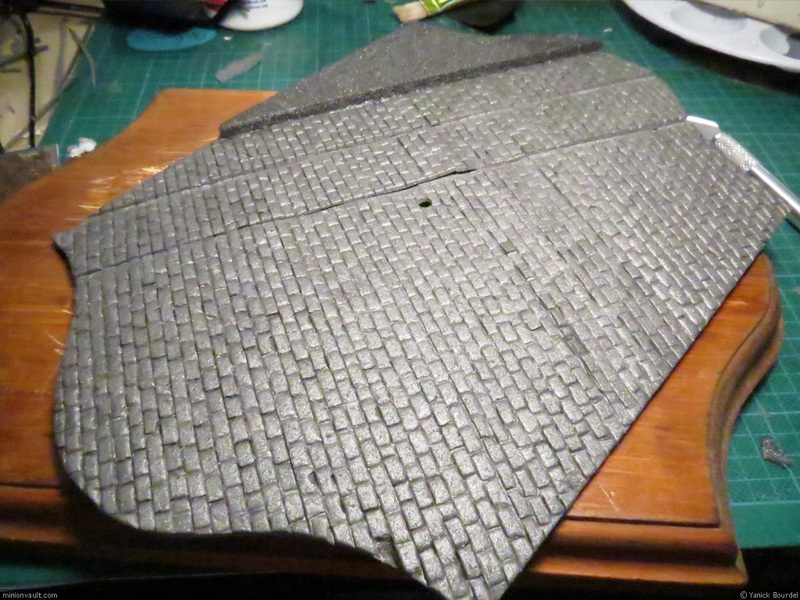 Then I made another shape that I glued on top of the first one: this will become the sidewalk. 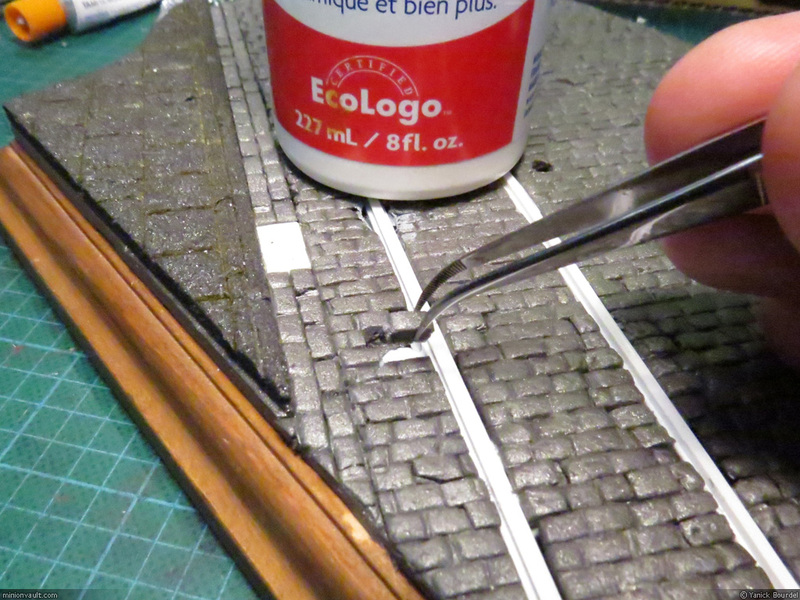 4- Using the X-Acto knife and a metal ruler, I carved 2 channels for the Tramway rails. 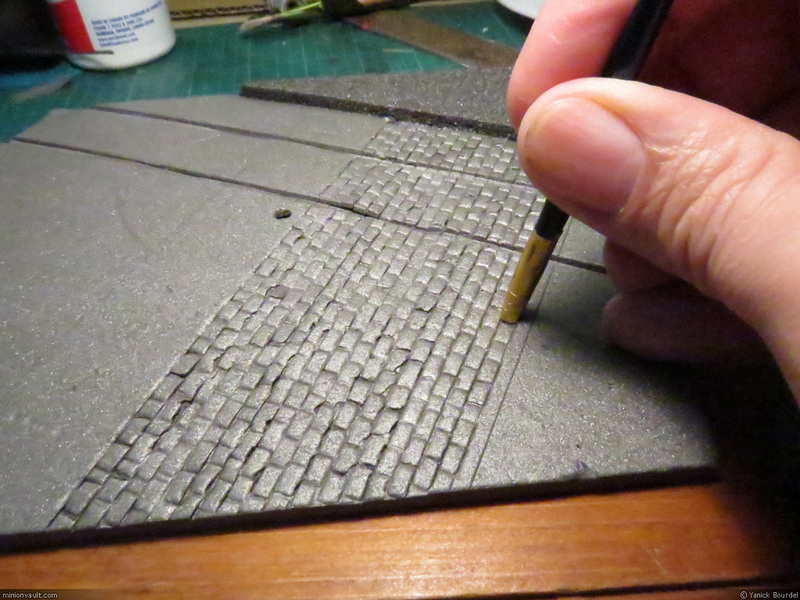 5- Then… the LONG work: using a custom-made tool (a modified old brush) I began stamping every stone of the pavement. Tedious. But the final effect was worth it, I think. 6- I did some carving on the sidewalk and used a small plastic bit to represent a drain cover plate. 7- I scratch builded a sewer manhole too, with left over bits and plasticard. 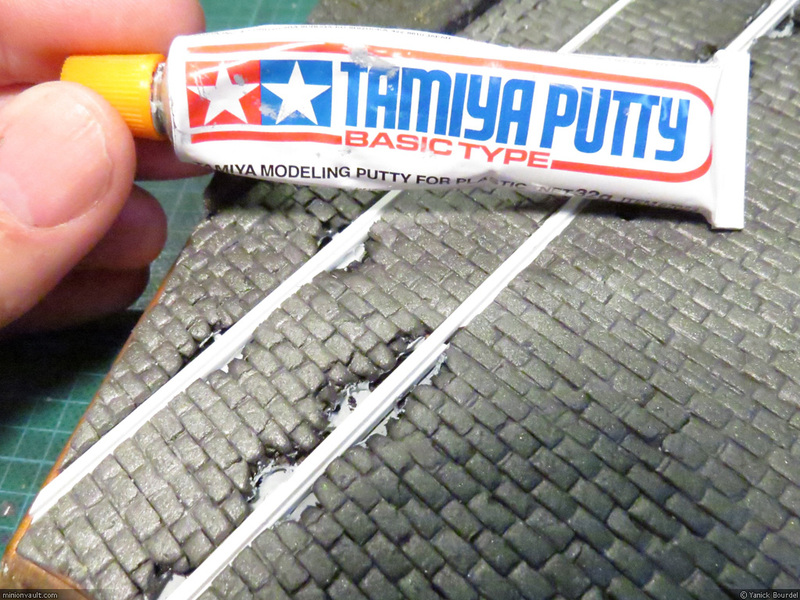 8- To make the Tramway rails, I glued strips of plasticard in a ” T ” shape. To glue them to the base was a challenge though: white glue won’t glue plastic very well, plastic glue would likely melt the foam core, and the hot glue gun was quite scary to bring close to my delicate foam carving… So I tried to use Tamiya putty, thinking it should bond quite well to both metal and foam. 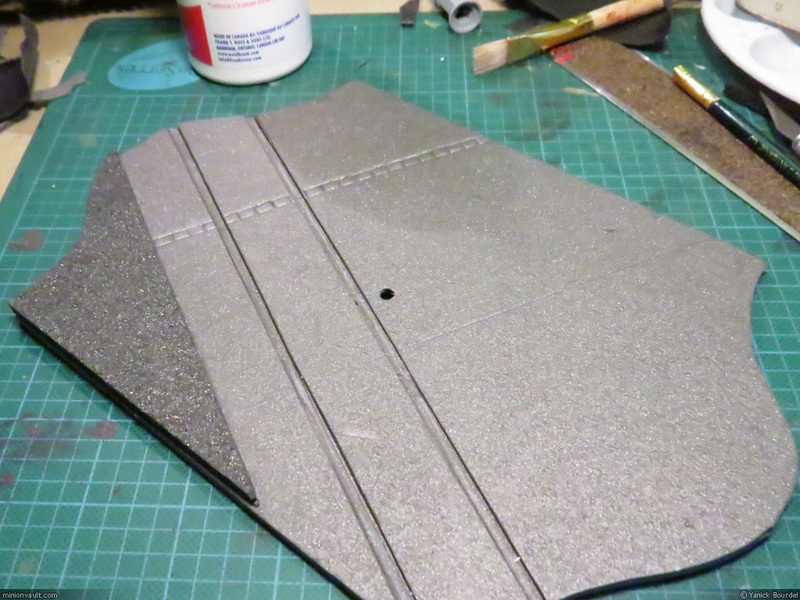 I did a test, but on a scrap piece of a DIFFERENT type of foam… B-I-G MISTAKE!!! It looked fine on the test piece, with very limited melting of the foam. 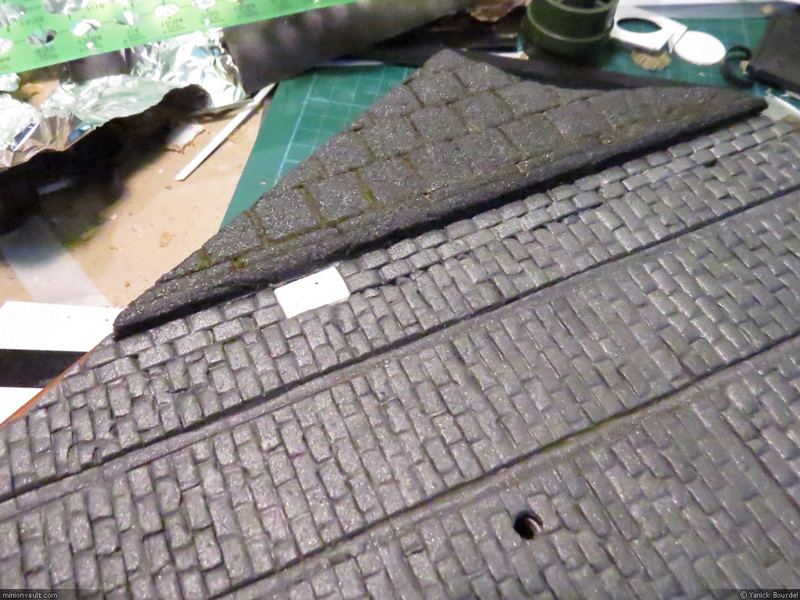 But on my diorama, the Tamiya putty solvent (Acetone I presume now) melted huge patches of pavement… ARGH…..
10- In the end, the final result is decent and once weathered It will look pretty much the way I wanted. Yeah! Now, I will paint my basic terrains from part 2 and 3, and add vegetation. A bit more complex this time: a small ruin terrain using styrofoam to simulate simple architecture. For this first terrain piece, I’ll make a boulder. 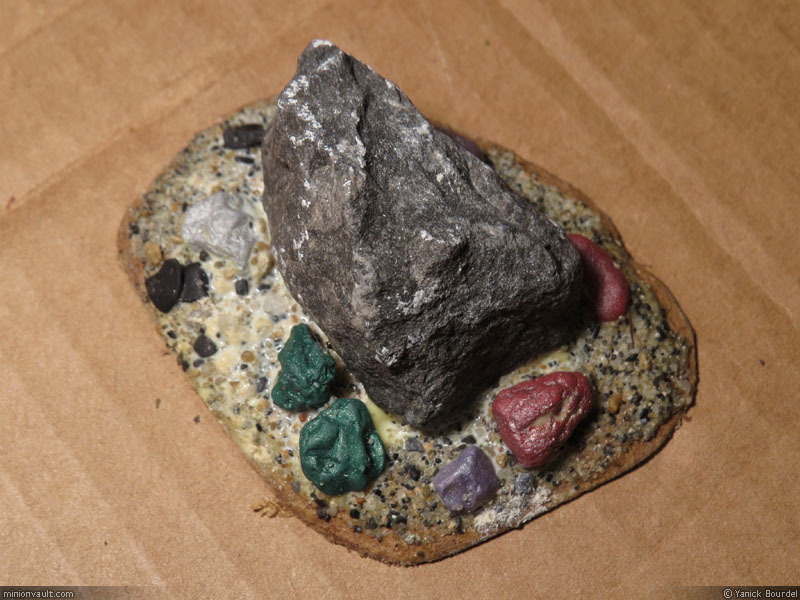 Unpainted boulder terrain. Looks good already! Wait to see it painted! Not really exciting, I know, but effective and useful on the gaming table. Plus, it is extremely inexpensive and easy to build. Something new on the blog: step by step project posts. It’s not really tutorials, and not really w.i.p. too, but rather a documented making of a project with explanations and tips. 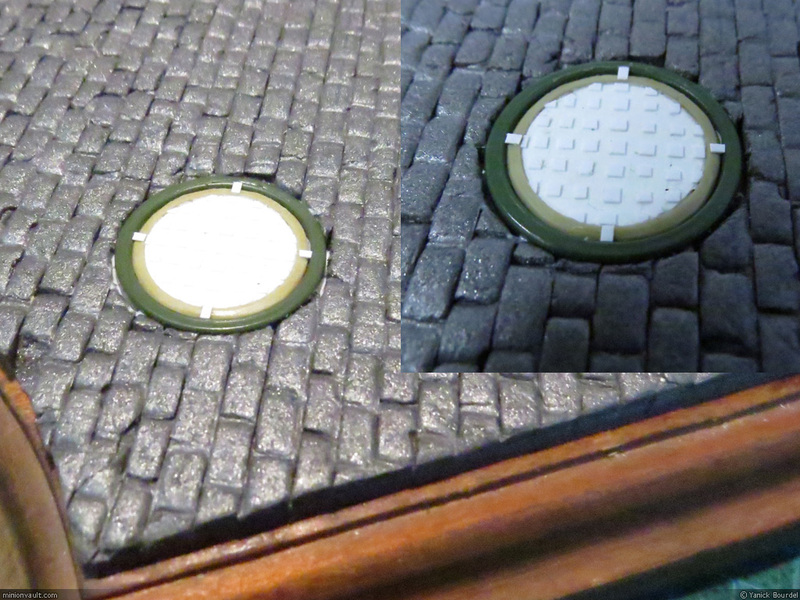 In this first part, I write about materials that will be used for part 2 and 3, where I will build 2 simple terrain pieces for the gaming table. 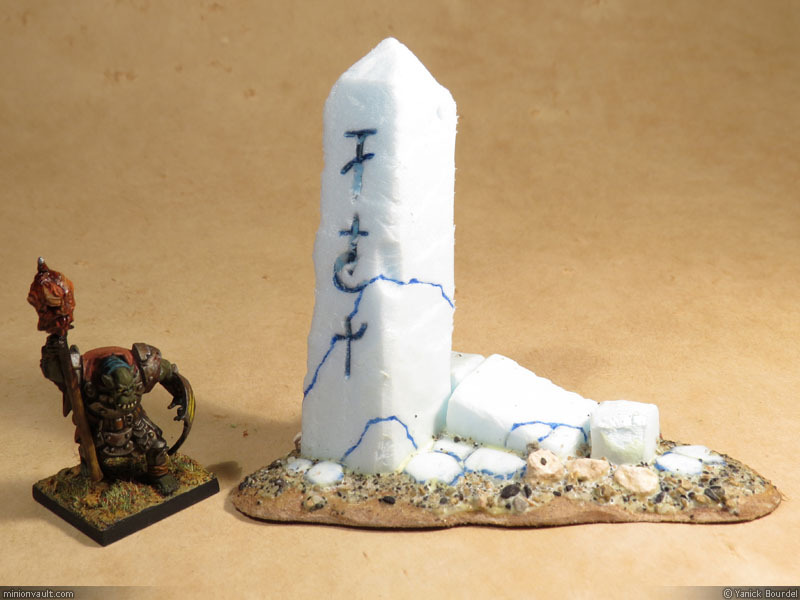 Step by step 1, 2 and 3 are well suited for beginners, but they will be interesting to read (I hope) for veteran terrain crafters. For paints, I will wait until part 4, where I will paint both terrain pieces.